LG G5 vs. Samsung Galaxy S7: Which one is right for you? If you’re an Android user and you’re looking to get the latest premium phone, you’re likely choosing between the recently-launched Samsung Galaxy S7 or the LG G5. Both phones are impressive in their own right, but because they’re virtually similar in their hardware offerings, choosing between one or the other could be tough. You could peruse through our reviews of both the G5 ($649 on Amazon) or Galaxy S7 ($633 on Amazon) to figure out which one is right for you, or you can simply peep through an abridged version we’ve put together for you here. Looks are important. If your primary concern is whether your phone’s design is truly eye-catching, you’re probably going to lock eyes with the 5.1-inch Galaxy S7 first. It’s metal and glass chassis is a fingerprint magnet, but it’s an exceptionally attractive one—not to mention water resistant. You can even choose from a larger 5.5-inch Galaxy S7 Edge with curved edges if that strikes your fancy. It has all the same components and features as its smaller counterpart, but with a bigger battery. 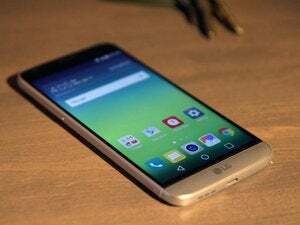 A closer look at the LG G5. The G5, on the other hand, is the first of LG’s flagships to be dressed in an all-metal chassis—or, as LG explains it, “microdized” aluminum. It comes with a removable battery pack and an optional swappable module called the Cam Plus that tacks on physical camera controls, though it costs an extra $70. The G5 also features a volume rocker on the left-hand side, and the Home button with embedded fingerprint scanner on the back. The G5 (bottom) is slightly larger than the GS7 (top). Both the G5 and Galaxy S7 are prone to scratches and bruises. I discovered this well after filing my review with the Galaxy S7 variants, though there are plenty of horror stories that have cropped up since then. The G5 is also not as durable as it seems, either, and our review unit is already covered in scratches on the backside. There’s little difference between either the G5 or Galaxy S7’s Snapdragon 820 processor. If you look at the benchmarks, you’ll notice there’s probably a bit of CPU throttling on the G5’s part, but you won’t notice it when you’re using the device. The Galaxy S7 and S7 Edge’s Game Launchers and its accompanying tools remain unparalleled. The Galaxy S7, however, does offer a software trick that enhances the mobile gamer’s experience. Its Game Tools are unparalleled. You can use them to dial down the performance of the phone so it doesn’t kill your battery, or record your game play if you’re plugged in and attempting to get your Twitch career off the ground. LG’s gamer options aren’t as robust. LG also offers a gamer-friendly option in the G5’s Settings menu, but it’s not really well exposed, nor is it as impressive as Samsung’s offerings. All it really does is adjust the video resolution to help you save battery while you’re in transit. Both the Galaxy S7 and G5 have impressive cameras. The Galaxy S7 features a 12-megapixel rear-facing camera with f/1.7 aperture and Dual Pixel technology, which means the sensor allows every single pixel to be an autofocus point. The G5, on the other hand, features a 16-megapixel rear-facing camera with f/1.8 aperture and laser autofocus. Seriously, you can’t go wrong with either device as a camera phone. A low-light photo taken with the Galaxy S7. The same low-light scene taken with a G5. The G5 does have one gimmick the Galaxy S7 doesn’t offer, and that’s an additional 8-megapixel wide-angle lens on the back. You can switch to shooting 135-degree landscape photos with the simple tap of a button. Rest assured, you’ll be fine shooting photos with either the G5 or Galaxy S7. Both phones also tack on an incredible amount of special camera features, and offer manual shooting modes that let you save RAW images. There can only be one phone in your hand. Which will it be? At this point in time, the Galaxy S7 is the best Android smartphone on the market. It remains unrivaled with its stellar gaming capabilities, sleek metal and glass construction, and extra features like water resistance, wireless charging, Samsung Pay, and consistent battery life. You can’t go wrong with one of the best smartphones of the year. However, there’s a special place in everyone’s heart for the underdog, which is why LG manages to make such a splash with each new smartphone. The G5 is plenty reliable with its battery swapping capabilities, takes fantastic photos in a variety of lighting conditions, and lets you shoot a wide-angle photo on the fly. The phone also takes some risks with its swappable modules, though they’re not the most polished parts of the phone. LG is opening up the hardware development kit for its modules, which could mean some neat stuff on the horizon. So if you choose the G5 now, you’ll have all the bragging rights of being first if and when those new modules hit the scene.